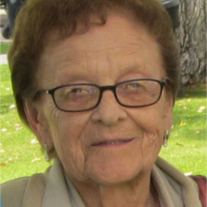 Dolores Marie Sasek Keller, 93, passed away peacefully on Feb 5, 2019 at Terrace Grove Assisted Living, Logan Utah. Dolores was born at home, on a farm, in Swanton Nebraska on October 4, 1925, daughter of Fred and Marie Drzka Sasek. Upon high school graduation, she went to work for the U.S. Army Air Corps as a civilian communications worker during World War 2 at Air Bases in Nebraska and then in Colorado Springs CO. While in Colorado Springs she met and fell in love with a handsome young serviceman named Gordon Nelson Keller from Brigham City, Utah. After a 3-month courtship they were married by the base chaplain on March 7, 1946. In 1963, after living in Chicago and Kansas, they moved to Logan where Gordon became the first Anthropology professor at Utah State University. Dolores attended Utah State, earning a bachelor’s degree in Business Education and a master’s degree in Social Work. She went on to work on the USU campus for many years, in the Communication’s Department and at the Dept of Agriculture Coyote Research Project. She became a fixture on campus, and it is safe to say she knew, and was friends with more people at the University than anyone before or since. She had personal relationships with everyone from the University President down to the custodians and students. Dolores loved talking to people and would strike up a conversation with anybody anywhere and before long would figure out some connection she had with a member of their family or a common friend. Dolores was particularly proud of her Czech ancestry and heritage and especially loved Polka music. She grew up in the dance halls of Nebraska where her father played the accordion in a dance band. She and Gordon attended Polka Festivals and Square Dances throughout the country. Although her husband passed away in 2010, she continued to enjoy an active and full life right up until the end, letting nothing slow her down. She was wheeling her walker up and down the halls of Terrace Grove until just a few days before her death. She was a loving and caring wife, mother, grandmother, friend and neighbor who will be deeply missed by all who knew her. Dolores is survived by her four children; Douglas (Nancy) Keller of Albuquerque, N.M., Susan Keller of Murray, Ut., Gregg (Thelma) Keller of Sandy, Ut., and Bradley (Elaine) Keller of Grover Beach, Ca., seven grandchildren, and four great-grandchildren. She was preceded in death by her husband Gordon, her parents Fred and Marie Sasek, her brother Alvin Sasek, and her sister Lorraine Hrdlicka. Funeral services will be held at 12:00 noon on Wednesday, Feb 13 at the Allen-Hall Mortuary, 34 East Center Street in Logan. A viewing will be held from 11:00 to 12:00 am at the mortuary prior to the funeral services. Interment will be in the Logan City Cemetery.